Il est vrai que ces sons étaient si violents que, s’ils n’avaient pas été toujours repris un octave plus haut par une plainte parallèle, j’aurais pu crois qu’une personee en égorgeait une autre à côté de moi et qu’ensuite le meurtrier et sa victime ressucitée prenaient un bain pour effacer les traces du crime. It is true that these sounds were so violent that if they hadn’t constantly been echoed an octave higher by a parallel wail, I might have thought that one person was slitting the throat of another right next door and that afterwards the murderer and his resuscitated victim had taken a bath to wash away all traces of the crime. Sodome et Gomorrhe is a novel of both society and intimacy, with Proust describing in minute detail the way people act in public. In the glittering soirée at the royal Guermantes’ palace, we see the cream of society, observing the upper classes as they go about what seems to be a strange mix between duty and pleasure, the tension of preserving a hard-fought rank barely concealed beneath charming smiles and heaving bosoms for some of the less popular visitors. However, later on we see a rather different style of soirée when the Verdurins, who played a major part in the opening book, Du côté de chez Swann, hold their own daily gatherings on the coast, more lively affairs, perhaps, but populated by a slightly lower class of guest. Yet part of the skill of the novel is the way these public façades are compared with how the characters act in private. Perhaps the best example of that here is to be found in the character of the Baron, a lion of society who snubs people as a matter of course. Once we get behind closed doors, though, it can be a different story, with his latest conquest, the musician Morel, having a growing hold over him. It’s isn’t only the gay characters who have to reconcile the two parts of their life, with several of the noblemen acting as good husbands in public while smiling in the direction of their latest lovers, discretely seated in a far corner. Reading À la recherche du temps perdu can be a strain at times. There’s a lot to be said for descriptions of balls and the like, but it can pall after a while, and in Sodome et Gomorrhe, Proust is really stretching the friendship. Trivial conversations go on for hours, and it takes thousands of words for Marcel to detach himself from an unwelcome partner; just when you think it’s time to leave, someone touches you on the arm in the hall and another twenty pages crawl by. If somebody could just get me my coat… That’s nothing, though, compared to the agony that awaits when we get to the Verdurins’ less elegant gatherings. The dinner that starts the second half of the book seems to play out in real time (with my speed of reading French, it probably did…), and even Marcel appears bored at times with the dull conversation. I was envious of one character, a doctor’s wife who was unable to stay awake and continually drifted off in her armchair. Believe me, I know how she felt. As always, our narrator is a delight to behold, an arrogant, chauvinistic, jealous mummy’s boy who (inexplicably) is loved by all and sundry (I still don’t really get why – my latest theory is that he’s very rich and incredibly good-looking). Arrogant to the point of rudeness (and far beyond), he even commands his friends only to visit him when he wants it. The worst aspects of his nature come together in the way he treats Albertine, demanding she be at his beck and call, jealous of anything and everything, and unwilling to countenance the slightest hint of individuality. When the idea that she might be interested in women crosses his mind, he immediately does everything he can to cut off her contact to all her female friends. Sounds grim, right? So why on earth should you read it? Well, just because Marcel is completely unbearable, it doesn’t make the story any less interesting. Having already invested so many hours in the work, the average reader will enjoy the slow development of the plot and the fleeting appearances of characters from earlier volumes. Themes are slowly beginning to be fleshed out – homosexuality and the Jewish question, of course -, and there’s a joy in watching the many parallels, or echoes, emerge in some of the most prominent relationships (Marcel and Albertine, Swann and Odette, the Baron and Morel). There are also large doses of dry humour to enjoy, even if it can be rather cruel at times. …et ainsi, dans un désir fou de me précipiter dans ses bras, ce n’était qu’à l’instant – plus d’une année après son enterrememt, à cause de cet anachronisme qui empêche si souvent le calendrier des faits de coïncider avec celui des sentiments – que je venais d’apprendre qu’elle était morte. J’avais souvent parlé d’elle depuis ce moment-là et aussi pensé à elle, mais sous mes paroles et mes pensées de jeune homme ingrat, égoïste et cruel, il n’y avait jamais rien eu qui ressemblât à ma grand’mère, parce que dans ma légèreté, mon amour du plaisir, mon accoutumance à la voir malade, je ne contenais en moi qu’à l’état virtuel le souvenir de ce qu’elle avait été. This was definitely the hardest for me to get through when I read it a couple of years back. Some of the commentary reads more like a Carry-On movie than one of our greatest literary monuments. There is a scene based on a misunderstanding of someone asking “are you one of them” that Frankie Howerd would be proud of. The good news is that it gets better after this – and the last volume is the best of all, not just because one sees the end in sight. So carry on – after shadowing the MBI of course. Well done! I’ve read the first two books in the sequence, but I stalled because my reading time is often fragmented into small chunks – which doesn’t fit Proust very well. I will get there eventually! I’m surprised you struggled with S&G; for me the one before it, ‘The Guermantes Way’, was the only one that was a real struggle—the parties just seemed endless. In comparison S&G is quite eventful. Proust could have done with a sensitive editor; the problem was that he kept adding bits when he was proof-reading it. The next two volumes are quite different than what came before, there are fewer parties but more paranoia and jealousy. This is probably the hardest one to get through and I may have skimmed through a lot of the party descriptions when I read it a long, long time ago (then again, I was in my late teens and probably quite enjoyed the party scenes back then). Well done, Tony, for making it through victorious and in French too! I was a right old pretentious twit at that age, as finding my teenage diaries confirms. I’ve been likewise wondering about the long descriptions of parties that Proust considered no less shallow than we (based on his wonderful ‘essay’ on the whole writing process and Art itself, in the last novel, Time Regained). So why did he write so much about something that he cared truly little about? I’ve come to a personal conclusion that it’s something of a linguistic approach to make us tired of these superficial activities by ACTUALLY making us tired, linguistically. Thus, language can be seen as a physical influence. Even if I’m not 100 percent right, the outcome is such. 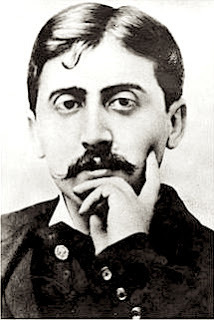 And we can’t really think that Proust knew less about language -and cared more for society – than his humble readers. The second half of Time Regained is amazing. It answers all the questions we’ve accumulated throughout the novels. It’s worth reading all the mind- numbing party scenes to realize, like the narrator himself only at the very end of the tiring journey, its whole meaning. I struggled with this one in part too, for similar reasons to you (there’s a review at mine as well as of the preceding volumes). After this I got bogged down timewise so it’s over a year now and I really need to get back to it and start the next volume since I still adore Proust. Well, the writer. Like you I do occasionally find it puzzling quite why he’s so in demand. But yes, however much any section may sometimes be a struggle, the reward is always passages of such insight and beauty that everything is forgiven. It’s an extraordinary achievement. Erik – I think you’ve joined us now – Happy New Year!! !